I’m a big believer in constantly pushing one’s boundaries to grow, learn and succeed, however one chooses to define success. But I struggle with the notion that every person can and should act a certain way, especially in the workplace where roles, goals and expectations are highly individualized. For many, the concept of “leaning in” or conquering one’s fears is not always possible, and especially not during a specified timeframe. For me, up until a number of years ago, just the anticipation of an important meeting would cause me to fret for days, even weeks in advance. Depending on the meeting’s importance, I would even get physically ill the day prior and endure sleepless nights. To manage this anxiety, I practiced deep breathing, tried different medications, and applied varied self-help techniques in order to manage a presentation without dread. Writing this now it feels rather surreal. Early in my career, I was confident and fearless, earning frequent promotions and given responsibilities that should have required a lot more training. Although the anxiety was always present, I was able to channel it into positive energy. I’m Type A, perfectionistic, and a bit obsessive/compulsive (typically that works in my favor), but it wasn’t until I experienced an episode of panic during a presentation that my anxiety started to consume me. This phenomenon didn’t emerge out of the blue. I had been living with anxiety my whole life. I have vivid memories working myself up into a frenzy as a little girl worrying when my parents went away, or even just for an evening. Fast-forward to the present: I started my own consulting business more than six years ago, and am at a point in my life where I’m more grounded, confident and not concerned about being judged by others. I attribute some of this to a successful career, as well as supportive friends and family, but if I’m being honest — I owe much of my self-confidence to the sport of triathlon. In 2017, I joined a local group of middle-aged women who were competing in short-distance triathlons. When I joined, I couldn’t run around the block, and I biked and swam recreationally; not for endurance. But, something compelled me to give it a “tri” (as triathletes say). Similar to many others, as soon as I completed my first sprint triathlon I was hooked, and continued to enter more tris and road races. As I approach my 50th birthday in 2019, I’m training for even longer distance events. It’s hard to express why I fell in love with the sport. It’s a lot of work and can be stressful and expensive. But something changed in me when I started to tri. From the camaraderie, to the excitement that comes from taking on a new challenge, and the high of crossing the finish line, my attitude became more positive. I began to conquer apprehension and fears related to running, biking, swimming as well as stressors in other areas. For example, for years following a car accident I would get panicky driving on highways and avoided them, preferring to take local, time-consuming routes. But a few months after my first races, I noticed that for the first time in nearly 20 years that I could confidently drive on unfamiliar highways without a sense of panic. The lead-up to a race, just like the lead-up to a presentation, can be nerve-wracking. There is a lot to think about and prepare for, so anyone who likes to be organized or is obsessive will mull the details over and over until the race begins. There are practical concerns everyone needs to think about and plan for, such as: What do I eat prior to the race? What will I consume for energy? How do I ensure my bike is prepped? Do I need a wetsuit, and will I have time to warm up in the water? Then, there are those who may ruminate over the less rational “what ifs, such as: What if I panic in the water? What if I don’t finish? What if I get hurt? What if I need to poop mid-race? Mary, a 42 year-old social worker, personal trainer and gym owner, has competed in four Half Ironman (HIM) triathlons (distance 70.3 miles). As a child, she experienced nightmares about having to jump in or cross raging rivers, which later required her to overcome a fear of “murky” water to compete in triathlons, which she did. Still, the anxiety of prepping for a HIM can consume Mary for weeks. Before the most recent event, she couldn’t stop worrying about her diet, stomach issues, the risk of hyperthermia, and transporting her bike, and she’d obsess all day and night about the race (races that require travel introduce a whole other level of stress). The euphoria of finishing each race has kept her going to the next one, but lately the anxiety has outweighed the joy, so she has decided to take a break. For 30 year-old Kathy, who works in software testing, having a routine to prepare for a race helps her manage pre-race jitters. A lot of her agita causes sleep disruption, so in addition to helping Katie feel in control, regular training makes her feel stronger, more positive, and sleep better. And then there’s the worry over performance time. Anxious athletes are still competitive, and the desire to ‘win’ or surpass a personal record can be all-consuming. Marni, 34, who works at a swim school and suffers from anxiety and depression, even worries that she will be dropped by her triathlon coach if her training times aren’t good enough. Regardless of how much worry and obsessing takes place before a race, once the event starts one needs to hyper-focus and make quick decisions. There’s no time to be anxious, and as the race evolves, endorphins run high, peaking at the finish line where one often forgets about any pain (mental or physical) and starts planning the next race (a phenomenon I often say is similar to the experiencing of child birth). Athletes can become so focused on finishing their race that they may ignore or underestimate the severity of injuries until after the finish line is crossed. For Angela, a 43 year-old massage therapist and personal trainer, triathlons provide a sense of high self-esteem and confidence. She has suffered significant trauma and experiences social anxiety, to the point of stuttering when highly anxious. However, when she’s training or racing, the anxiety disappears, there’s no stuttering, and there’s no self-doubt. In these instances, training for long distances may replace pharmacotherapy. I have seen many social media posts by athletes who have endured serious injuries while training (including major bike crashes), who agonize over whether they should compete in an upcoming tri, or push through the discomfort. Anyone observing these posts can see how silly it would be for a person to actually compete, but to the injured athlete, the thought of not following through with a race in which they’ve invested so much time, money and hope, can be devastating. According to Cory Nyamora, PsyD, a certified USA Triathlon and USA Track & Field Coach, and founder/director of Endurance-A Sports and Psychology Center in California, anxious athletes may also worry that when things are going well, something bad will happen. “Too much of their identities can get wrapped up in the sport,” says Nyamora, “so — just like in life in general — it’s important to have some flexibility and balance, and do other activities.” The same applies to the rigors of training. Dr. Nyamora asserts that elite athletes are very in tune with their bodies and know when to take a break. Amateur athletes, however have a tendency to push themselves too hard, and are more prone to injury. There are many reasons people compete in triathlons, not the least of which are the endorphin and oxygen boosts, and the various feel-good factors that accompany training and racing. Like Angela, people who suffer from anxiety and depression report being able to skip drug therapy while training and racing regularly. Dr. Nyamora says that other major benefits include sticking to a routine, as well as improved nutrition and mental health practices. 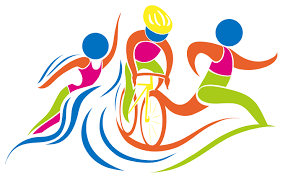 High energy, “type A” personalities who are drawn to triathlon learn that skipping sleep and meals to achieve goals will backfire when aiming to compete in triathlon races. Dr. Nyamora also explains that the experience of competing in triathlons helps participants let go of things that are out of one’s control, a key attribute for those prone to anxiety. Regardless of how much one prepares, there are things that will happen during the course of a race that need to be dealt with in real-time, and one learns how to go with the flow. Diane has built her entire social life around triathlon. After moving to a new town five years ago with her husband, she started the area’s first tri club, which motivated nine senior citizens to do an Ironman a few years ago (which is freaking amazing!). And then there are the more extreme reasons. According to Marni, triathlon training and racing saved her life. At 19, she competed in her first sprint in March 2004, finishing third in her age group, and continued to place in the top of her age group for several years. A few years after she began racing, following several let downs during college and in a post-college teaching job, she attempted suicide four times in a two month span. Her parents made her move back to her hometown and enter therapy. Through therapy, Marni came to realize that she would never have made it that far if it wasn’t for triathlon. Today, despite also suffering the untimely loss of her mother in a tragic accident, she is managing well and still going strong in triathlons, 15 years from when she started. She has to manage her anxiety and feelings of ‘not being good enough’ to reach the podium, or obsessively worrying about a race, but the sport remains a focal point of her life.